Betsoft invites you to discover a secret world inhabited by all manner of woodland spirits. Look under every toadstool and behind every nook to uncover 4 enchanted progressive jackpots. This is a 5-reel and 10 fixed paylines slot based on a fantasy theme. It is home to a red faerie, a purple faerie, a weeping willow, a dragon fly and golden-coloured butterfly. Part of the charm of this slot is its combination of pastel-like background artwork and detailed symbols. Together with the serene music, the slot gives off a spiritual feel, which may be a good way of winding down after a hard day in the office. 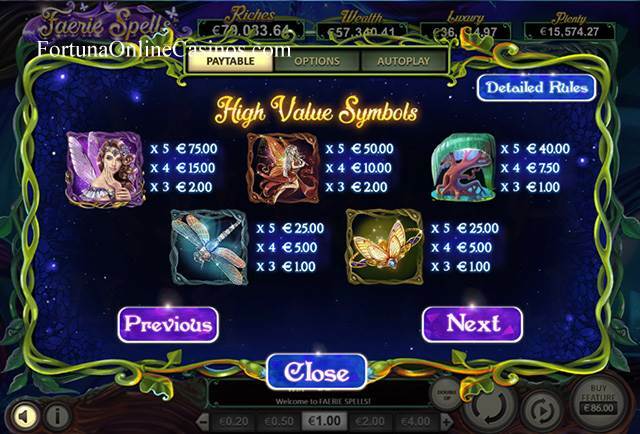 As is the case with all modern slots, this one is designed to be fully taken advantage of on mobile, tablet and desktop. It's like magic in your pocket using an Android or iOS device. Features of the game include progressive jackpots, wilds, free spins and a double up game. Before playing with real money, we recommend trying Faerie Spells for free here to see if it's something you like. If you're ready to visit the enchanted forest for real, you can find the slot in these casinos. We should start off by saying that the graphics and sound track are a very appealing part of the game which effectively reinforces the theme. We found the Magic Toadstool Feature very difficult to trigger but the Free Spins not as hard, though we never managed to unlock more than 10 at a time. The best results are likely to come from the free spins, though this can be hit and miss as well. Not surprisingly, unlocking a progressive jackpot is extremely difficult, but you can still come away with a decent haul from other prizes. 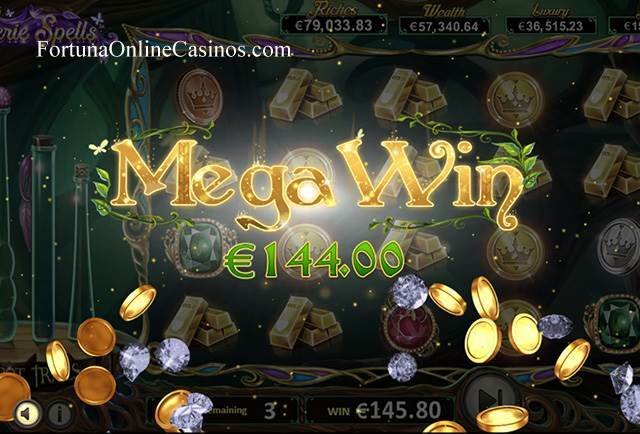 We suggest you consider the Buy Feature which is your ticket into 25 free spins since the best that we could manage to win in the main game was 15x our bet – far short of the maximum of 100x. This game is more suitable for someone with a high risk tolerance and appreciates high volatility slots. The game is a progressive jackpot which shares its prizes with other slots that also use the "Trail System". Amongst the features that you'll find is the tree guardian wild, who reminds us a little of Treebeard from Lord of the Rings. Well, this wild substitutes for all the lower and upper-value symbols. He can even form his own payline. The Magic Toadstool is a symbol which has prizes attached - but there is a caveat! The faerie queen must also be present somewhere on the reels. At the same time, it is also possible that these symbols create a payline win. 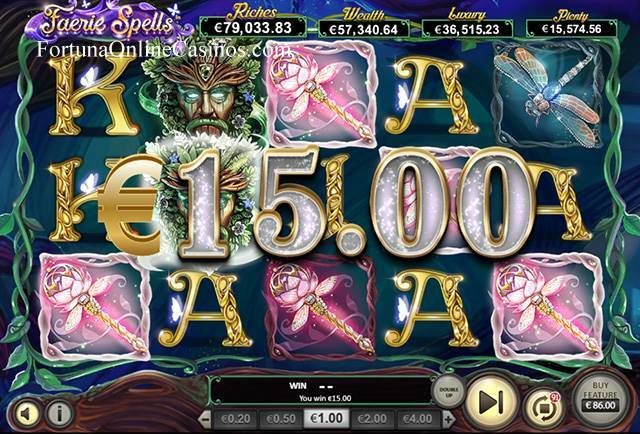 The big feature of this slot is by far the Faerie Queen Free Spins which is triggered by 3 faerie queen scatter symbols. Your award is 25, 15 or 10 free spins with 5, 4 or 3 symbols, which is played on an alternate reel and alternate symbols. The feature pays 1,024 ways-to-win. What makes the free spins so big? Well, it is through the free spins that you get a crack at one of the 4 progressive jackpots. During spins, you may find that jackpot symbols corresponding to respective jackpots may turn up. These are called Riches, Wealth, Luxury and Plenty. You'll need to collect 9, 8, 7 or 6 of one of them respectively to win the progressive jackpot. The developer refers to this as the "Trail System." A diamond scatter symbol might be another symbol that turns up on a spin and this one will reward you with cash according to the number (up to 5) and of course your bet size. While in free spins mode, both the jackpot and the diamond scatter symbols explode to give rise to a cascade action for the chance to maybe even create new wins or add jackpot symbols. If you're impatient, then you can also buy your way into the 25 Free Spins Feature. Finally, the Double Up Game is a chance to collect double your round winnings by guessing the result of a coin toss.